First off, I am not a nutritionist and I am not about to pretend that my stealth health recipes provide a perfect, balanced meal in every recipe. My general recipes certainly don’t – some food just has to be because it tastes good! The thinking behind what I call “stealth health” is to take the foods that picky eaters will eat and add to that, in many instances, in disguise, some goodies, that they otherwise won’t. So if your child will eat banoffee pie, I’m not suggesting that a banoffee pie only diet would be at all good for them, what I am suggesting is that, working with what you have, if they’ll eat it anyway, why not add something extra that gives them some of what they do need? It’s simple, no fuss and from there, gradually building the variety of the foods they will eat, you can gradually stop disguising the “good for them” bits and encouraging them gently towards a full varied diet. If that turns into a nightmare, you can always revert to the hidden veg they’ve got used to. 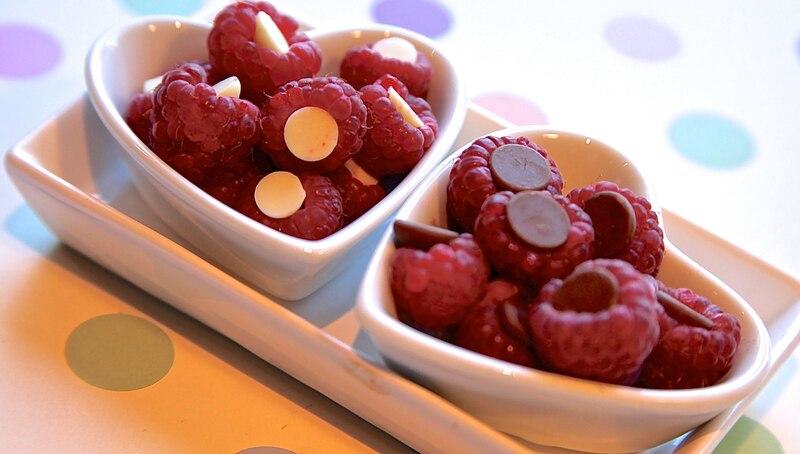 The raspberries in the banner picture are a great example – most kids like chocolate in one form or another so popping a chocolate chip inside a raspberry might encourage them to think of a berry fruit, rich in antioxidants and vitamins, as a treat they will try. Issie, my daughter, doesn’t really like raspberries. With her, it isn’t a problem as she eats so many other fruits, but she wanted to have a go at making these and is the kind of kid who likes to try her own creations. She decided she could take or leave the milk chocolate version, she then tried just one with dark chocolate and didn’t like it at all but she absolutely loved the white chocolate ones. I don’t like her to have too much chocolate but a few chips with a handful of raspberries is far better than a Milky Bar on its own! A leading nutritionist recently told me that something like 80% of school age children are still not getting there full 5-a-day. There has recently been new recommendations that we should be aiming for 7-a-day and in some countries, the recommended daily amount is 11! I was really astonished to find that given the efforts of probably the biggest cookery personality this country has ever seen, i.e. Jamie Oliver with his School Dinners campaign, we Brits are still struggling with what is actually a minimum target. But what does 5-a-day mean in real terms? The recommended break down of that is that 3 of the 5 should be made up of vegetables and 2 of fruit. A portion is about a handful (and that’s the hand of the eater – so a child’s portion is smaller than an adults). Only one portion should be from juice, regardless of how many fruits and or vegetables go into that juice and how much of it you drink. This is down to all that is left behind in the pulp when you create a juice. So a smoothie is different as it includes the pulp and can provide more than just one portion. The same goes for pulses and legumes – it doesn’t matter how big the portion or what the mix, they only count as one of your 5. Whilst the generally accepted wisdom seems to be that potatoes should not be included as one of your 5-a-day, they aren’t a nutritional zero – a serving of potato is better than a serving of white bread, for example, in terms of nutrients. Did you know that there is more vitamin C in a serving of baked potato than in an orange? Chickpeas are a great source of all sorts of nutrients. They’re high in fibre and contain 10 different vitamins. In particular they’re a great source of thiamin and B6, which helps the body convert food into energy, so they’d be a great snack on test/exam days when the kids have been revising into the night before! Chickpeas provide multiple essential minerals, including calcium, magnesium and phosphorus – essential to healthy bones and they’re higher in potassium than bananas. A lot of kids love humus, which is fabulously easy to make – just blitz the chickpeas in a blender with some garlic, olive oil, lemon juice and tahini – obviously it’s better for them if they’ll eat it with raw vegetables but if you can only get them to eat it with toasted pitta, it’s still good for them in its own right. This may not sound appetising, but I promise you it is quite addictive – try warming through naan bread, breaking it open smearing humus inside, tucking in some crispy bacon and some pickled beetroot for breakfast! I use Maple syrup rather than honey in most of my recipes. This isn’t just a personal preference (although I do prefer maple syrup if using it in the raw). Maple syrup is actually better than honey for what I am trying to achieve! Here goes with some science – for a starter, and I for one was quite surprised by this, maple syrup is lower in calories than honey. It’s quite a significant amount – over 10%! Also the carbohydrate content in maple syrup is primarily sucrose, which is a complex sugar that your body breaks down into equal parts of fructose and glucose whereas honey’s carbohydrate content is pretty much pure fructose and the problem with that is that too much fructose is detrimental to heart and liver health. Honey is however higher in vitamin content but maple syrup is much better on mineral content. So I suppose that’s a balancing act as to what you are trying to achieve. On the whole, I tend towards maple syrup as I don’t use it in my recipes for the “what is good for me” content. I use it as it adds sweetness, so the concern for me is much more about avoiding what is bad for me. One final thing to really keep in mind is that you should never give honey to babies or to children with a vulnerable health profile due to the risk of botulism. That’s a risk you don’t run with maple syrup. The botulism content of honey is very real – it is even as significant as the risk of say salmonella with raw eggs. Thank you – I’m happy to look at posts by guest writers yes. Please let me see what you’re thinking about.